I have a couple of announcements before we dive into today's recipe. First! It feels a bit surreal, but there are only two weeks until Near & Far is released. And, related to the release, there are a number of events in the works. The first will be held on my home turf at CAMINO on 9/17 - there are a handful of seats left (and already so many of my favorite people in one room!) - can't wait to celebrate with each of you! For a full (evolving) list of events & signings you can check this page. 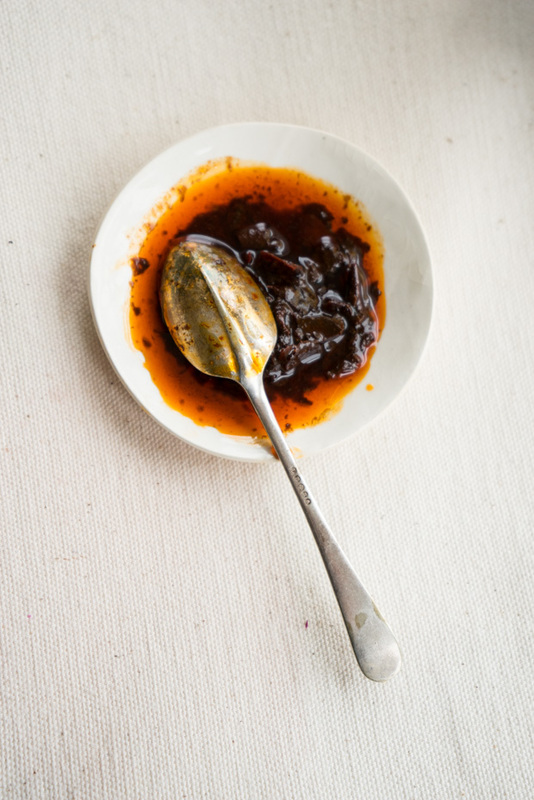 On the recipe front, this chile relish has been a staple this summer. It's the sort of thing you can grab to slather on all sorts of simple, quick preparations to add a bit of magic and flavor. It adds depth, raisiny-chile flavor, color, and dimension. 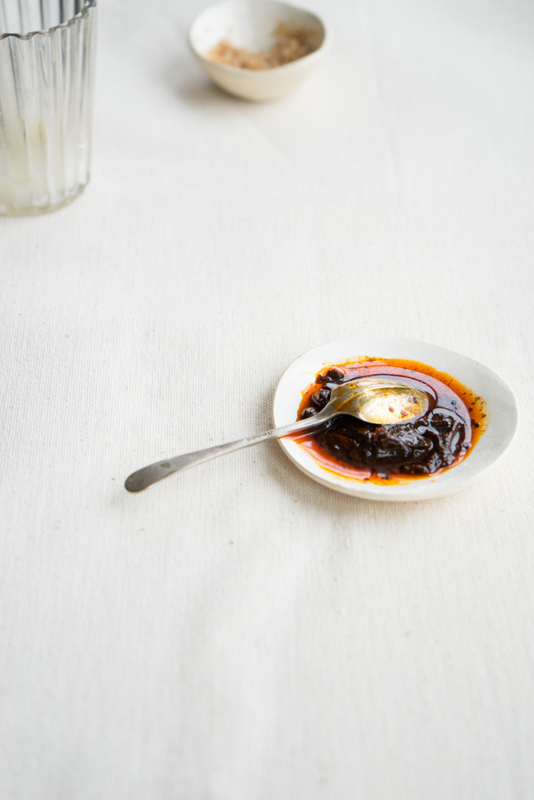 You can serve it as written, or separate the chile from the chile oil to serve. I'll list all the ways I've used it down below. Enjoy! - Breakfast taco: I do something like the five-minute breakfast taco I wrote about on this page, but finished with a hit of the chile relish. - Special beans: Heat a splash of olive oil in a saucepan, toss in a big handful of shredded kale, saute, stir in some cooked beans (I've been using Santa Maria Pinquito beans all week), and finish by stirring in a big dollop of the chile relish. - Nori wrap: Had this for dinner last night. Spread some coconut brown rice across a sheet of nori, top with some cooked beans, add sliced avocado, some of the chile relish, and some crispy fried shallots, or toasted almonds (something crunchy). - Tempeh: Steam some tempeh, and while that is happening, combine a big dollop of the chile relish with a with a splash of shoyu to slather on the tempeh. This was easy & tasty! - Chile Creme Fraiche - simply swirl chile relish lazily into a small bowl of creme fraiche to use as a condiment or accent. - And this is how I like to do beans & rice. 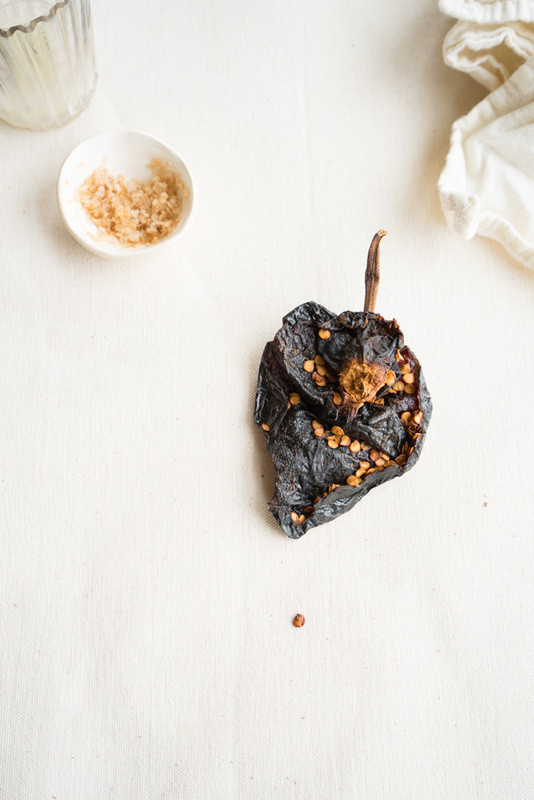 Look for ancho chiles that are raisin-like and pliable in texture. I used to make a variation of this for this Rick Bayless soup, and now make it with a range of chiles, and in larger quantities. Cut the chiles into confetti-shaped flecks using scissors or a sharp knife. Heat the oil in a small saucepan over medium heat. Add the chiles and stir for a minute, until fragrant, then remove from the heat. Add the vinegar, the water, oregano, and salt. Set aside and let stand for at least 1/2 hour, stirring occasionally. Taste, and adjust with more salt if needed. You can also adjust with a bit more vinegar if you like more bite, or more olive oil to round out the flavors a bit. I often top off the chile relish with a splash of olive oil to extend the amount.